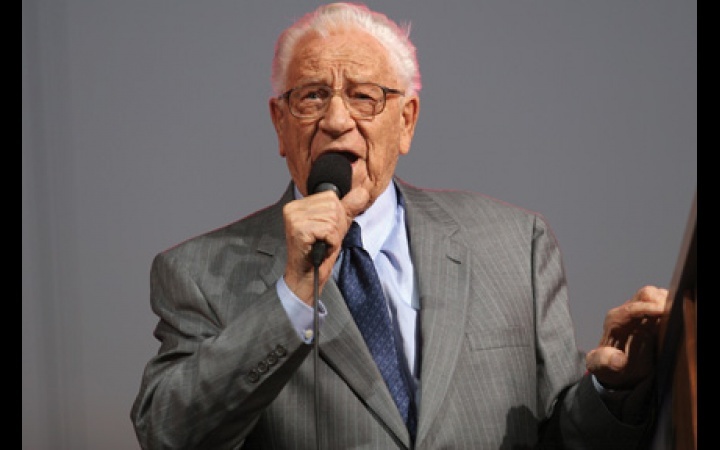 George Beverly (Bev) Shea, who always prefaced Billy Grahams sermons with a simple gospel song, passed away last week at the age of 104. Shea, more than anyone on the Billy Graham team, had strong and continuing links to Ottawa and its environs. He was born in 1909 in Winchester, a 30 minute drive south of the capital. His father, Adam Joseph Shea, was the minister of Winchester Wesleyan Church, at the time. There were eight children in the Shea family: Bev was the fourth. Later, during Bevs teen years, the senior Shea and his wife, Maude Mary Theodora, moved into Ottawa itself, where he took over the pastorate of Sunnyside Wesleyan Church, still a strong congregation just a few steps away from Carleton University. Many students including numbers enrolled in the university’s landmark journalism program worship at Sunnyside. Behind the podium, Shea was both simple and professional. In person, he was friendly, self-effacing, outgoing and a great story teller. One of his favourite stories recounted how his mother left the words of a poem on the piano, where she knew her son would see it. Shea was at a point in his life where he needed to make some decisions. The poem began with the words Id rather have Jesus… They had their impact on the young singer. He took them to heart and, later, set the words to music. And, after going to work for Graham, he sang those words thousands of times. They were used to prepare Grahams listeners for the gospel the evangelist wanted to communicate. For a journalist, Sheas story-telling made him a good interview subject. But, more than that, he was humble and self-effacing. He had a way of making those he was talking with feel better about themselves, because he genuinely was interested in their lives and what they were doing. The last time Edna and I saw Bev Shea was in the little Wesleyan Church in Winchester, where his father had been the pastor. He was 101 at the time, as I recall, and the town of Winchester had just honoured him by identifying itself as his birthplace. Signs pointing out that fact had been installed beside all roads leading into town. The little church was packed and crowds poured out onto the lawn and sidewalk outside. A Skype link had been arranged with a Salvation Army band camp in Maine where gospel ‘booming baritone’ Wintley Phipps, a great admirer of Shea, was poised to exchange memories with him. At the same event, representatives of the RCMP Pensioners Fund presented Shea with an honorary membership. When he was a teen, Shea wanted to be a Mountie. He recalled, with a sheepish grin, that he switched his vocational aspirations to gospel singing when he found out that being an RCMP officer might require him to take a first posting in the frigid Arctic. Upon receiving the Mountie honour, he asked, with a good-natured growl: Where is my red coat? Most summers, the Sheas would spend time in West Quebec, where they had a lakeside cottage. His first wife, Erma Scharfe, was an Ottawa valley girl. She died when he was in his sixties and, a decade later, he married North Carolina native Karlene Aceto. You don’t have to be around Ottawa long to learn that hundreds of Scharfs dot the city and valley. A cousin of Ermas, Diane Scharf, (different spelling, still a relative) has been a leading legislative assistant to Liberal and, later, Conservative parliamentarians for decades. In her spare time, she mentors dozens of younger Hill staffers in the ways of Christian servant leadership. Thatcher, the late prime minister of Great Britain, came from devout Methodist background, a point acknowledged at her Anglican funeral, where the main congregational hymn was Charles Wesleys Love Divine All Loves Excelling. One of her most significant statements regarding her beliefs about the roles of faith and politics were contained in a speech she gave to a Church of Scotland general assembly in 1988. The text of that speech can be found at www.margaretthatcher.org/document/107246. Neuharth headed the Gannett newspaper chain until 1989 and founded its flagship national daily newspaper, USA Today, in 1982. Some of his research into the feasibility of that newspaper became available to me when I was working on my MBA thesis at Simon Fraser University in the 80s. That thesis, in turn, helped in the decision-making processes in the early years of what became BC Christian News, which published from 1982 to 2011. Wright was the founder and head of Oak Bay Marina, a waterfront tourist magnet in the Victoria suburb of the same name. Before he developed that business, he was a district advisor in the Victoria Times circulation department, where I was a teenage carrier-salesman. In that role, he taught me much about the role of the newspaper and how to put its best face forward. Later, I moved to Vancouver for my first job and education. Returning home one weekend, my father took me to see Wright, who had just taken over Oak Bay Boathouse, a primitive little facility. We sat on apple boxes in his office cubbyhole while he showed us sketches about what he hoped Oak Bay Marina would become. He was a colourful, sometimes controversial community leader and vision-caster. And, because he made his money from the ocean, he contributed $11 million, a few years ago, to the University of Victoria to develop the Bob Wright Centre for Ocean, Earth and Atmospheric Sciences.